This is our free TEAS Science practice test. The ATI TEAS Science test covers four major topics: scientific reasoning, life science, earth and physical science, and human body science. It is very challenging test because it requires a lot of specific scientific knowledge. You will definitely want to spend a lot of your test prep time on this section. Get started now with our 48 TEAS Science practice questions. You should be able to complete these within 59 minutes. The correct answer is (C). The number of protons in an atom’s nucleus is also the atomic number of the atom. In this case, we are told that there are 45 protons present and that the atomic mass is 64; however, when looking for the atomic number, we do not need the atomic mass. Consequently, the atomic number is 45. The square above is based on the eye color of two parents, one of whom has brown eyes and carries the recessive gene for green eyes (a). What is the probability that a biological child of these parents will have brown eyes? The correct answer is (C). 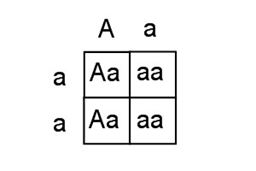 In the Punnett Square pictured, two of the children have brown eyes(A) and carry the recessive green gene(a) = (Aa), while two of the children have green eyes (aa). There is a 50% chance these parents will produce offspring with brown eyes (Aa). The spleen functions are part of the _____ system. The correct answer is (B). The spleen is part of the lymphatic system. Like the lymph nodes, it acts as a blood filter. Which of the following is an example of deductive reasoning? Only 21% of a town’s population have expressed a desire to ban all cars. Therefore, the new proposition banning cars in the state is not likely to pass. People who brush their teeth regularly have fewer instances of heart disease. Therefore, good dentistry can prevent heart attacks. All soccer players who play professionally can kick well. Therefore, any future soccer player who is recruited to play professionally will be able to kick well. All secretaries are good typists. Cynthia is a secretary. Therefore, Cynthia is a good typist. The correct answer is (D). Deductive reasoning starts with basic premises that are assumed to be correct, and draws a specific logical conclusion. It often follows the logic: A ➞ B, C ➞ A, therefore C ➞ B. (C) might be tempting, but is an example of inductive reasoning. (A) and (B) are logically flawed. Which of the following is a possible cause of herniation of discs? The correct answer is (B). Disc herniation occurs when the inner core of a disc in the spine leaks out through the outer portion of the disc. This type of spinal injury is usually caused by an injury to the back and/or spine. Whiplash suffered from a minor impact could potentially cause a herniated disc. Which of the following is a characteristic of the autonomic nervous system? It regulates the voluntary control of body movements through the skeletal muscles. It is the part of the nervous system consisting of the brain and spinal cord. It regulates involuntary activity in the heart, stomach, lungs, and intestines. It is thought to be the center of intelligence. The correct answer is (C). The somatic nervous system controls voluntary actions, while the autonomic nervous system functions primarily below the level of consciousness, to control functions such as digestion, heart rate, respiratory rate, perspiration, salivation, swallowing, and breathing. The central nervous system consists of the spinal cord and brain. During photosynthesis, which two compounds are combined to create the output of glucose and oxygen? The correct answer is (A). During photosynthesis, water and carbon dioxide are absorbed by the plant and converted to glucose and oxygen. Which of the following is true about the frog? It is a member of the salamandridae family. It is a type of amphibian. It is closer to most tetrapods than to most newts. The correct answer is (B). 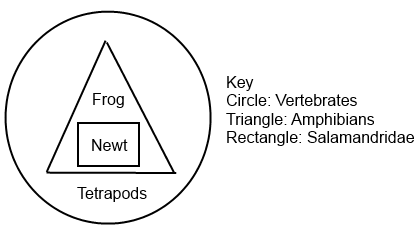 Since the frog is inside the triangle, and the key indicates the triangle represents amphibians, it is logical to conclude that the frog is a type of amphibian. Which statement can be inferred about amphibians? All amphibians are salamandridae, but not all salamandridae are amphibians. Some amphibians are vertebrates, but not all amphibians are vertebrates. Some salamandridae are amphibians, but not all amphibians are tetrapods. All amphibians are vertebrates, but not all vertebrates are amphibians. The correct answer is (D). While all the amphibians are located inside the “circle” of vertebrates, there is nothing to indicate that ALL vertebrates are amphibians. What would this diagram be useful for? The correct answer is (A). The chart is not specific to any particular disease. Since it starts with “exposure” and ends with three phrases that all use the word “transmission,” the diagram is logically used to determine whether exposure to disease will lead to disease transmission. What type of bond between the complementary bases of DNA stabilizes the double helix structure? The correct answer is (C). Hydrogen bonds form between the bases to stabilize the double helix structure of DNA. The correct answer is (B). While the entirety of an atom’s nucleus contains neutrons, protons, and electrons, only the neutrons and protons are found inside of the nucleus. Electrons exist as a cloud surrounding the nucleus and thus are not found inside it. Which of the following statements is true regarding trophic levels? Tertiary consumers acquire more energy content than secondary consumers. Producers acquire less energy than primary consumers. Secondary consumers acquire more energy than primary consumers. Tertiary consumers acquire less energy than primary consumers. The correct answer is (D). There is always a decrease in the amount of energy transferred from lower trophic levels to higher trophic levels. In general, the higher the trophic level of the consumer, the less overall available energy. Primary consumers have more energy available than both secondary and tertiary consumers. Why does the human eye perceive a red colored dress as the color red? The molecules of the dress do not absorb red light wavelengths. The molecules of the dress absorb green and blue light wavelengths. A red dress will primarily absorb red light wavelengths. A red dress will not absorb light wavelengths from non-red colors. The correct answer is (A). When light hits an object, the object absorbs some of the light and reflects the rest of it. The wavelengths that are reflected determine how our eye perceives the color. We see a red dress as “red” because those wavelengths are reflected and not absorbed. In a lab experiment designed to test the rate at which plants grow under artificial light, the kind of light used is which type of variable? The correct answer is (B). In an experiment, an “independent variable” is a factor controlled by the scientists. A "dependent variable" represents the output or effect. Since the light is controlled by the experimenters, it is an independent variable. Which organ system is primarily responsible for regulating metabolism, mood, and growth? The correct answer is (C). The endocrine system is the collection of glands that regulate metabolism, growth and development, tissue function, sexual function, reproduction, sleep and mood, among other things. Also ‘Regulating’ is a big hint in this problem. In a vacuum, why doesn’t an elephant accelerate faster than a penny as it falls to the ground? Vector components of an elephant are more complex than those of a penny. An elephant is not a projectile, while a penny is. They both have an acceleration of 9.8 m/s2. The elephant is greater in mass but is slowed less by the effects of air resistance. The correct answer is (C). More massive objects will only free-fall faster than smaller objects if there is a significant amount of air resistance present. For a penny and an elephant that are free-falling in a vacuum, the rate of acceleration would be the same, so both would fall at the acceleration due to gravity which is 9.8m/s2. Which train described below would have the greatest momentum? The correct answer is (A). The momentum of an object is equal to the mass of the object times the velocity of the object. The largest momentum from these choices comes from 9500 x 200 = 1.9 million. The correct answer is (B). When one factor affects a second factor, it can be said that the two have a strong correlation. Since the salmon population decreases as the invasive species population increases, these two factors have an inverse relationship. Increase the energy required for the reaction to take place. Increase the time required for the reaction to take place. Increase the rate at which the reaction takes place. Reduce the amount of products in the reaction. The correct answer is (C). A catalyst, by definition, is an enzyme that helps decrease the energy necessary to begin a reaction. Consequently, the addition of a catalyst to a chemical reaction will increase the rate at which the reaction takes place. A reduction in the energy required to begin the reaction means that the reaction will take place more quickly. The pharynx is part of what body system? The correct answer is (A). The pharynx is part of two systems; the respiratory and the digestive. It is another name for the throat, which extends from the base of the skull to the level of the sixth cervical vertebra. Which of the following is true about eukaryotic cells? The correct answer is (D). Unlike prokaryotic cells, eukaryotic cells contain mitochrondria, a nucleus, lysosomes, and multiple chromosomes. The correct answer is (B). The number of neutrons is what gives the element its specific isotope. The number of protons determines which element it is, while the number of electrons determines if the atomic particle has a positive, negative, or neutral charge. What is NOT true about RNA? It contains a sugar called ribose. Thymine is not one of its base pairings. It is unstable in alkaline conditions. Its sugar is more reduced than DNA’s sugar. The correct answer is (D). DNA is stable under alkaline conditions, while RNA is not stable (as RNA has an –OH instead of an H, as in DNA). Which of the following scenarios would NOT give a normal distribution? A distribution of the yearly income of families in the U.S. The percentage of toxic wastes and pollution in the atmosphere vs. the lifespan of organisms in the location. A curve with 97% of the population within the first two standard deviations. The correct answer is (C). It is likely that as the percentage of toxic substances in an environment increases, the percentage of living organisms will decrease. This would be an inverse relationship and would not exhibit a normal distribution. The rest would show normal distribution. In a cell, the Golgi apparatus is found in what location? The correct answer is (D). The Golgi body, or simply the Golgi, is an organelle found inside the cytoplasm inside a cell. While it is close to other organelles, it is positioned independently on its own within the cytoplasm. Which taxonomic rank is the next-smallest after Order? In plants, ________ involves the formation of a _____? The correct answer is (C). Cytokinesis happens after telophase and it is the splitting of one cell into two. In plants it involves the formation of a cell plate whereas in animals it involves the formation of a cleavage furrow. Which base is NOT found in DNA? Which of the following layers of the atmosphere is the closest to space? The correct answer is (D). The thermosphere is the highest level of atmosphere before the exosphere, in which the atmosphere’s molecules drift into space. Which is NOT one of the four basic types of tissue? The correct answer is (A). The parenchyma of an organ consists of that tissue which conducts the specific function of the organ and comprises the bulk of the organ. It is not one of the four basic types of tissue: epithelial, nervous, connective, and muscle. The stomach is _____ to the small intestine. Which of the following is the atomic mass of an atom containing 42 protons, 42 electrons, and 37 neutrons? The correct answer is (B). To calculate the atomic mass, we must sum the number of protons and the number of neutrons inside of the nucleus. The electron’s size is miniscule in comparison to both the proton and the neutron and as a result does not contribute to the mass of the atom. So, adding 42 protons with 37 neutrons results in an atomic mass of 79. The correct answer is (C). The hippocampus is the site of memory storage. The medulla oblongata is involved in involuntary controls, the corpus callosum is involved in connections between the two lobes and in emotions and the Pituitary gland is an endocrine organ..
What process is illustrated in the diagram above? The correct answer is (A). Meiosis is a two-step process, and the four cells that result each have half the normal genetic material of the original cell. Of the following, which is not a type of chemical bond? The correct answer is (D). Ionic bonds involve the donation of and acceptance of electrons. Covalent bonds involve sharing electrons. Polar bonds describe electronegativity differences. Magnetic bonds are not chemical bonds. If the amount of hydrogen in a balloon of fixed size is doubled, what happens to the mass and density of the balloon? The mass and density both decrease. The mass increases, but the density decreases. The mass decreases, but the density increases. The mass and density both increase. The correct answer is (D). As the number of molecules of air increases in a given volume, the mass of air also increases. As the mass of air in the given volume increases, its density also increases. If you have 200 mL of a 60% sodium chloride solution, how much NaCl is dissolved in the solution? The correct answer is (D). A 60% NaCl solution would be made by dissolving 60 g of NaCl in slightly less than 100 mL of water, and then increasing the volume of the solution to the final 100mL of water. If we had 200 mL of a 60% NaCl solution, then there would be 120 g of NaCl dissolved in the solution. The correct answer is (D). For a chemical reaction to be balanced, the amount of reactants must be the same as the amount of products. As there are 24 total carbons in the reactants, there should also be 24 carbons in the products. The graph above records the death rate of two types of male flies a certain number of days after a chemical pesticide is sprayed. What is the probability a male methuselah fly will be alive 75 days after exposure to the pesticide? The correct answer is (D). On the x-axis, 75 days corresponds to roughly 20% on the y-axis. 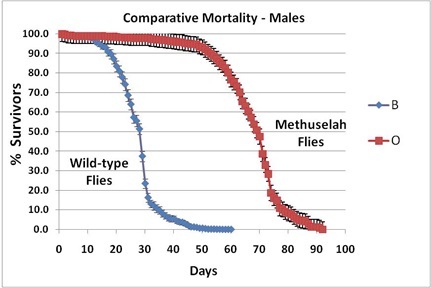 Since about 20% of the methuselah flies survive after 75 days, the probability of one fly’s survival is 1/5. A scientist wants to write an equation using the variables X, Y, and Z. What is the proper relationship between the variables if X represents time, Y represents energy, and Z represents power? The correct answer is (D). Power is equal to energy divided by time. 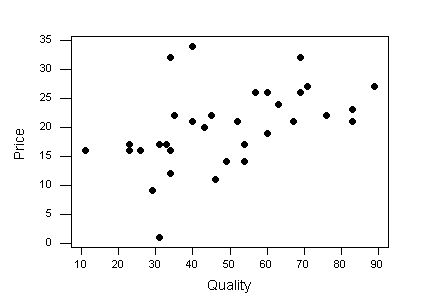 What type of correlation is presented between price and quality? The correct answer is (B). Although the correlation is not strong, it appears that the price increases as the quality increases. This describes a weak direct correlation. The correct answer is (C). 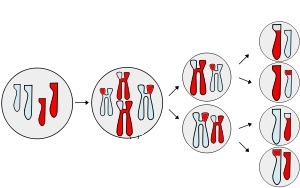 Mitosis produces two diploid daughter cells that have the same genetic material as the original mother cell. The correct answer is (A). All three animals belong to the same kingdom of Animalia, but are too different to be classed in the same phylum. Cheetahs and rainbow trout are in the Chordata phylum, while inchworms are in Arthropoda phylum. The presence of which hormone would NOT cause an increase in water retention? The correct answer is (B). ANP, or Atrial Natiuretic Peptide is a hormone released in response to increased blood volume and pressure that produces vasodilation. As a consequence of this vasodilation, the excretion of both sodium and water increases in order to return to the homeostatic conditions prior to increased blood volume and pressure. Because excretion of water increases, ANP causes a decrease in water retention and not an increase. In which part of the heart does oxygenated blood flow out of? The correct answer is (B). Oxygenated blood that leaves the heart is pumped from the left ventricle. Which of the following hormones are secreted directly by the hypothalamus? The correct answer is (C). Dopamine is a neurotransmitter in the brain that plays vital roles in a variety of different behaviors. Which of the following terms do these diagrams NOT portray? The correct answer is (D). 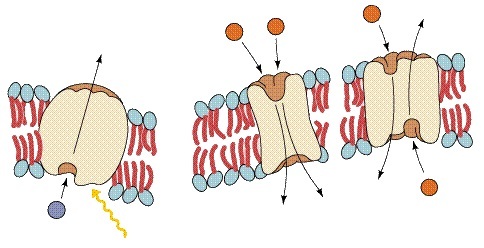 The first one is active transport as it requires ATP and the other two are symporter and antiporter respectfully. They both require facilitated transport. The only one not shown is an ion channel which requires no energy besides a gradient and is not active transport as it uses no ATP.